I have consumed a great many meals on a good many college campuses in my time. Truly, some of my fondest sandwich memories have come from on-campus or campus-adjacent eateries: the truly spectacular but pricey sandwiches from the Ord Market on the territory that comprises CSU Monterey Bay; the turkey and Swiss croissant microwaved with love and served out of a small shack in the middle of San Francisco State. California State University, Los Angeles is heavy on the name-brand fast food and light on the independent sandwich shop or eatery. There is, however, a storefront in the food court called Johny’s Kitchen, which appears to be a singular entity. The menu is far-reaching diner fare, and when I found myself in need of a quick breakfast, I gave them a shot.There were half a dozen breakfast sandwich options or slight variation: bacon and egg, sausage and egg, ham and egg, etc. served on one’s choice of bread. I opted for the bacon and egg on wheat, and unfortunately, was served a sandwich that will in no way hold a special place in my heart. There was a significant quantity of egg…I would say between two and three eggs, and a few strips of bacon served on two pieces of slightly grilled toast. There was no butter on the bread, no seasoning in the eggs, and no other element to the sandwich. It is among the blandest sandwiches I have ever encountered. Even a dash of salt and pepper would have made the sandwich exponentially better. I can’t imagine that the other bread choices of rye, white, or sourdough would have improved the sandwich, either. We talk a lot about the unnecessary inclusion of cheese in sandwiches, but any cheese at all on this sandwich would have been a marked and welcome improvement. As I chewed and swallowed this massive, warm wad of egg with an extremely slight bacon flavor, I reflected on the fact that one of the breakfast sandwich options was merely “double egg.” I felt a deep sadness for any unfortunate soul who elected to travel that unappetizing road. 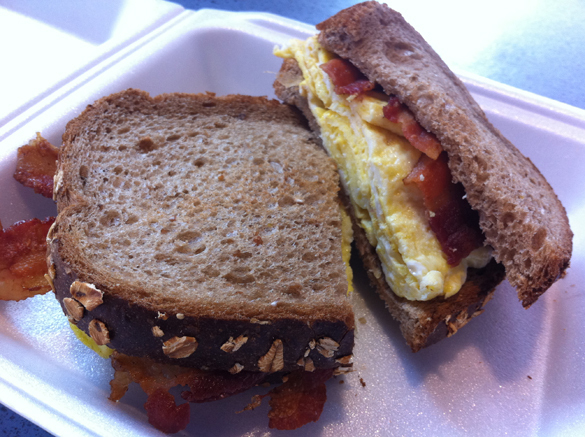 This entry was posted in General Sandwich Discussion, Sandwich Reviews and tagged Breakfast, Egg, Los Angeles, Reviews by Bill, Sandwiches I Have Eaten, Sandwiches Made For Me by bengrimm. Bookmark the permalink. I like breakfast sandwiches, but they need to be well executed. Obviously this one wasn’t. Although flavour/seasoning was your biggest problem, from the look of the picture I’d say that the way they’ve cooked the egg probably didn’t help either. It looks a bit like an omelette. I prefer scrambled egg for a breakfast sandwich.